Racism in the United States: Who’s Responsible for Fixing the Problem? Racism remains a prevalent problem in the United States. 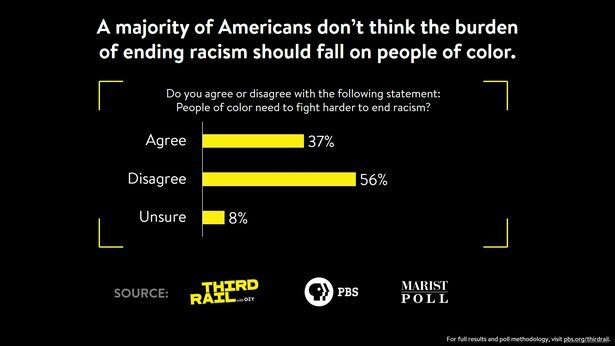 But many Americans do not think the responsibility to end racism is exclusive to one race. 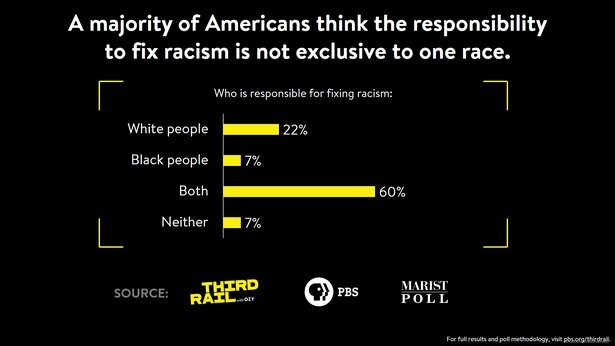 Rather, the responsibility belongs to both black and white people, according to an exclusive THIRD RAIL WITH OZY-Marist poll. Americans perceive the solution to lie in the hands of everyone, and do not believe black people need to work harder than others to end racism. The disparity in the perception of societal advancement between blacks and whites has not improved. Although half of Americans assert that both black and white people have an equal chance of getting ahead in today’s society, by more than 10-to-one Americans say white people have a better chance than black people of doing so. And, this disparity has changed little over the past 20 years. The onus to improve race relations is on everyone, according to 60% of Americans. However, 22% of residents believe the responsibility belongs to white people, and 7% say black people need to work on correcting the problem. A majority of residents (56%) do not think people of color need to work harder to end racism while 37% believe people of color need to do more. A racial divide exists. African American (57%) and Latino (42%) residents are more likely than white Americans (32%) to say that people of color need to work harder to end racism. 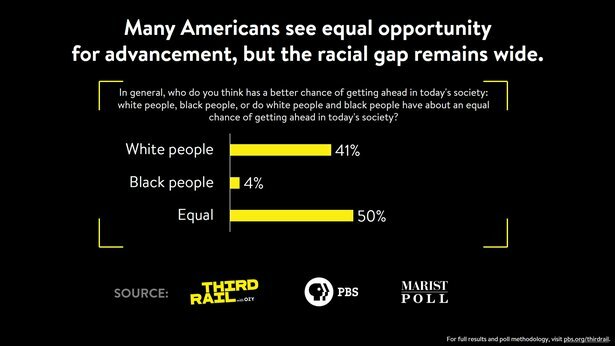 Half of Americans, 50%, think white and black people have an equal chance of getting ahead in today’s society. This is little changed from 46% of U.S. residents who expressed this view in a 1997 CBS News/New York Times survey. Forty-one percent, compared to 43% two decades ago, say white people have a better chance at advancing. Only 4% think black people have the edge in getting ahead, similar to 5% in the 1997 survey. Again, opinions differ by race. While a majority of white Americans, 54%, say both black and white residents have an equal chance of advancing, nearly two-thirds of African Americans, 65%, and half of Latinos, 50%, report white people have the advantage to move ahead in today’s society. Americans perceive racism to be a bigger issue in American society than sexism. 54% of U.S. residents consider the nation to be more racist than sexist. 24% think America is more sexist than racist. One in ten, 10%, say the United States is neither racist nor sexist, and 12% are unsure. Both men, 48%, and women, 61%, think the country is more racist, but interestingly, men, 28%, are more likely than women, 19%, to consider it to be more sexist. 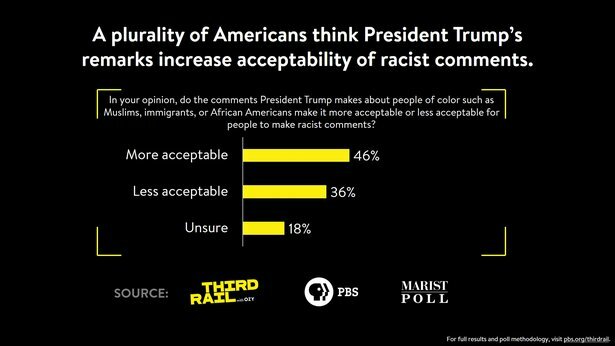 The poll asked Americans: do President Donald Trump’s comments about people of color such as Muslims, immigrants, or African Americans make it more or less acceptable for people to make racist comments? A plurality, 46%, says it makes it more acceptable, including 63% of African Americans and 53% of Latinos. 36% of Americans think the president’s remarks make it less acceptable. Nearly one in five, 18%, are unsure. Democrats, 67%, and independents, 49%, are more likely than Republicans, 20%, to believe President Trump’s comments about people of color make it more acceptable to make racist comments. 50% of Republicans say his statements make it less acceptable. More than half of Americans, 51%, think the anti-immigration movement is simply about securing the country’s borders while 35% believe it is really an anti-people of color movement. 14% are unsure. Again, Democrats, 63%, African Americans, 57%, and Latinos, 46%, are more likely than Republicans, 5%, and white residents, 29%, to think the anti-immigration movement is about race.